Wouldn’t you like to play? Late last year a series of grisly murders in the town of Valley Falls captivated the world. A handful of victims were abducted at various points throughout the month, killed in gruesome ways, decorated to resemble popular children’s toys, and gift-wrapped for the police to find. Among those “toys” that were created and left for the authorities: a life-sized Jack in the Box that caused a spring-loaded victim to pop out of the top when the handle was cranked, a Nutcracker doll decorated with greasepaint and blood, a robot that was created from both human and mechanical parts, and a marionette whose movements could be controlled via a series of cables that were attached the victim’s limbs. The gift cards attached to each one were all signed by someone calling themselves “The Toymaker.” Police were closing in on the culprit when The Toymaker stopped killing, causing the trail to grow cold. They have continued to pursue leads throughout the year, but they haven’t had any real breakthroughs in a while. Earlier this week, a new “gift” arrived from the killer, and it is reasonable to assume that the murders will start anew. If the pattern holds, there is only a very finite amount of time to investigate before The Toymaker goes underground again. No doubt The Toymaker has more “toys” in mind to create so lives are at risk. I really enjoy The Deadbolt Mystery Society’s unique brand of deductive puzzling, and hunting down deranged serial killers is a favorite theme for me, so The Toymaker sounded like it’d be right up my alley. My fiancée, however, isn’t quite as into spooky horror themes, and the creepy cover of the box remained covered for her benefit until we could begin the game. Porcelain dolls are just spooky! I definitely got a much more horror based vibe from this box, and couldn’t wait to start, however! That being said, I think it is fair to say this case, in spots, is much more intense than usual. There were several descriptions and visuals that my fiancée did not enjoy, and I skipped over these parts of the case for her benefit. These were mostly due to a particular startling image as well as the descriptions of the murder victims. Nothing over PG-13 and luckily, nothing completely integral to the case was too intense, but I felt a trigger warning of sorts would be helpful for those trying to determine if this case is right for them. Personally, I quite enjoyed this darker turn, but I know that this sort of thing isn’t for everyone. This is Deadbolt’s most challenging box yet! The puzzles and clues left behind by The Toymaker are maliciously clever, and tie excellently into the theme. I especially enjoyed the broad variety of puzzles, some of which can feel very odd at first, but build towards satisfying revelations as more evidence is added to the growing pile. I am very much enjoying how new case files are compiled into booklets, and though the suspect list returns to it’s former method of inclusion, the way they are presented has been updated and fits well within this particular investigation. Further world building of the town of Valley Falls is fantastically developed during this case, and every new box of late feels like they’ve been building towards… something. It’s perhaps just speculation on my part, but there are some ominous inclusions in each box that make me feel like our investigations might be hurtling toward something big. Whether that’s just the thrill of detective work leaking over into imagined clues, or a possible big reveal, it has been a lot of fun to develop theories all the same! The mystery itself is high quality, with a fair amount of evidence and information to sift through. I enjoyed how seemingly random bits of information become clear clues as we solved our way through the game. Attention to detail has always been important with Deadbolt Mystery Society cases, but The Toymaker truly ramps up how it layers details within each leg of the journey. I was also thrilled to see that some of the elements of real time detective work returned during this case, as we were tasked with gaining entry to particular parts of the Maroon District and talking to new and interesting characters. I really hope this is a continued trend, as it lends an amazing sense of immersion to each case. Delve into the seedy underbelly of The Maroon District, and bring The Toymaker to justice! The Toymaker is another enjoyable entry into the files of The Deadbolt Mystery Society, but burgeoning sleuths should be warned, it’s definitely one of the more challenging cases we’ve solved! Newcomers might want to hold off on this one until they have solved a case or two with the Society, but veterans will enjoy stitching together the devious clues left behind by The Toymaker! Join the Deadbolt Mystery Society here! Right now, you can get 30% off your first box with the Promo Code ESCAPE30! You can also see the rest of our Deadbolt Mystery Society reviews here! It’s called fashion, honey. Look it up. The great fashion designer Stella Stone was working feverishly on her masterpiece, a dress design that was sure to stun the world with it’s elegance! Unfortunately, she passed away tragically young, but not before she could secret the design away from her most bitter rival. Fast forward almost one hundred years later, where Sullivan King has been hired to find the design by a descendant of Stella’s, Poppy Farthing. The more things change, the more they stay the same, however, as Poppy has a rival searching for the designs as well, and the race is on between Sleuth Kings and Hard Boiled Investigations! Luckily, Sullivan has an ace up his sleeve to help with this case… you! As much as I love taking down serial killers and mad kidnappers during Sleuth Kings cases, the lighter cases always have an irresistible charm about them. This almost one hundred year old mystery dating back to the roaring twenties was definitely something new and exciting, and knowing Sleuth Kings, it would be a highly immersive case! Sleuth Kings cases are always very carefully layered, with puzzles that build upon each other almost as elegantly as Stella Stone’s designs, and this case is no exception. In fact, Case 015 felt like one of the most challenging, yet satisfyingly complex cases to date. The interconnectedness of this case delivered some highly original puzzling, and made sure that every bit of the game felt important and well clued. Props included within are even more well done than usual, with excellent hand-crafted aging and twenties inspired designs that stay true to the mystery’s theme. I especially loved the buttons included with this case, as they gave me something to fiddle with while we solved, and were absolutely something we expected to find in a dressmaker’s shop! Honestly, Sleuth Kings’ world building skills are second to none, and it’s a joy to have a glimpse into their version of the prohibition era. The game flow is silky smooth, and the puzzles lead into one another perfectly, yet still maintain a level of challenge that veteran sleuths will adore. The game remains accessible, however, and never reaches the point of being obtuse. Sleuth Kings has perfected the art of putting together a case worthy of Sherlock by including hints within clever details, and encouraging detectives to pay close attention to all the clues. This case really shows off how satisfying it is to notice the little things and strikes a perfect balance of hidden clues, fiendishly cunning puzzling, and a well told story. Case 015 has it all! Puzzles, mystery, and buttons! There were several points within one puzzle where additional information was included that seemed to serve no real purpose. It was a small red herring, (unless of course, it was a side puzzle we never figured out,) but led us down a side trail that we were fortunately able to quickly rule out. Other than that, we loved this one! Case 015 continues Sleuth King’s run of brilliance, and delivers an enticing mystery filled with original puzzles wrapped within an unexpected, but wholly immersive, theme. This one is truly a favorite, and it is always a thrill to see how this subscription continues to evolve! Even though this is probably one of the more complex cases on offer, I definitely recommend it to anyone looking for an enjoyable mystery to solve at home! This case can be purchased from the Sleuth King’s archives here, and if you’d like to subscribe to upcoming adventures, you can use the promo code ESCAPEADVENTURE to get $5 off your subscription here! You can also read the rest of our Sleuth Kings reviews here! A bit of heroin for your cold will fix you right up! It’s 1867 and the rain has been falling in Charleston, SC for four straight days. Citizens are beginning to worry that Dr. Trott is the reason for all their woes, due to the fact that he’s captured a mermaid within his apothecary and refuses to set her free! The unprecedented storm threatens to bury the whole city underwater unless you can find the mermaid and set her free. Dr. Trott returns in an hour, though, so you’d better act fast! Dr. Trott’s Apothecary is based on a local legend that you can read about here! It’s really quite fascinating that people truly rioted outside of a pharmacy because they thought that the owner was holding a mermaid hostage, but that’s the 1800’s for you. An escape room based on the hidden legends of Charleston really sounded like a fantastic idea, so we were very excited to give Time Traveler Escape Games a visit during our most recent trip out! Dr. Trott’s Apothecary is well decorated, housing some excellent tech, lighting, and sound effects to simulate the storm, as well as other hidden surprises to assist with the immersion factor of the game. Though there are a few trick puzzle boxes and locks, generally a huge escape room sin, they are clued cleverly and justify their inclusion by being more than just a box purchased online and sat in the room for no thematic reason. The game flow runs nicely, and is non linear for the most part, with a subtle clue to start off the room’s puzzling threads. Each section of the apothecary feels like it’s own level of sorts, with all the threads coming together to unlock the next segment, leading to another challenge that repeats the process. 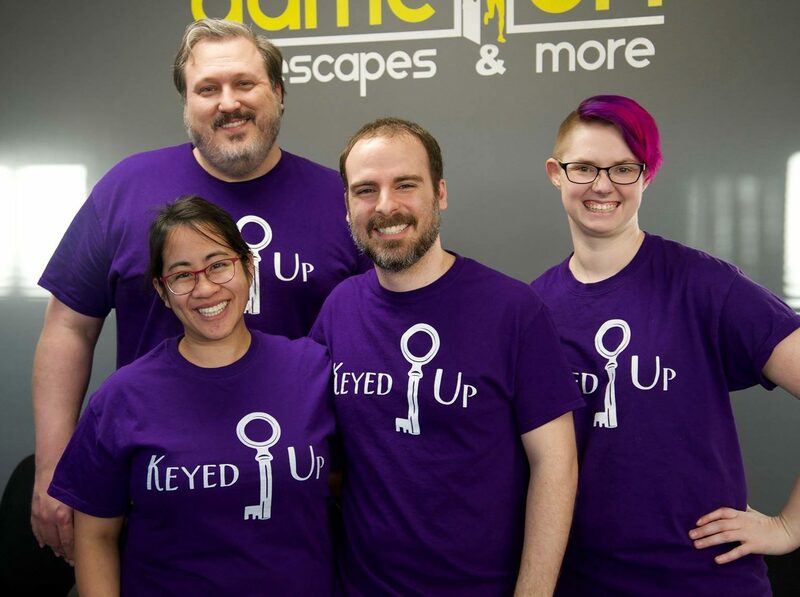 We are big fans of this video game like style of escape room puzzling and are glad to see it catching on in Charleston! Connections within the room are intuitive, and the meta puzzles for each step work smoothly, with the original and sometimes room spanning puzzles keeping our group of five engaged with the story throughout the entire adventure. When we needed a hint or two our GM provided clever clues that gave us just the right amount of push without giving the answer away outright, which is always appreciated. There’s quite a few props to play around with, and all of them are integrated well into the theme of a sea loving, (perhaps too much,) pharmacist from the 1860’s. One puzzle failed spectacularly on us, and it seemed like there was no backup to overcome the technical problem. Though we eventually were able to force it to finally trigger, it burned a lot of time off of our clock. From behind the scenes looks of other tech heavy rooms I’ve done, I’ve noticed most have a program of backups in place should a puzzle be solved and the prop not trigger, so that might be worth looking into for Time Traveler Escape Games. Though light on hidden objects for hidden objects’ sake, there is one that felt overly well hidden, and without a puzzle or clue to help find it, it feels like a random scavenger hunt rather than an exciting solve. One early puzzle was interesting, but involved a fairly large leap of logic, coupled with searching for a small marking that just blends in with its surroundings, leading to some early frustration on our part. There’s also no timer within the room, which adds to the authenticity, but can make marking your progress within difficult, so this could really go either way based on your preferences. Dr. Trott’s Apothecary is a fun room for first time players and enthusiasts alike, delivering multiple stages of puzzling fun. Though there are a couple points at which the room failed on us, these seem to be isolated cases of bad luck and I still recommend checking this one out in order to delve into the hidden history of Charleston for an hour, and commend Time Traveler Escape Games on coming up with such an excellent idea. Book your rescue mission here! Full Disclosure: Time Traveler Escape Games comped our tickets for this room.